I’m often asked, “What are the best travel stories to write?” The answer is: whatever you enjoy writing about. Maybe you enjoy writing food, wine, or beer stories. Or perhaps luxury resorts and lodges are more your style. Some writers like to write about romantic cities and wedding destinations. 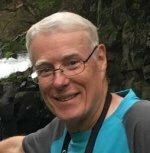 I especially enjoy writing about military vehicles and museums, historical re-enactments, and gold mining history and places. But, by far, my favorite travel stories are roundup pieces. Roundup rodeo event at Mt. Adams in Washington State. When I hear the word “roundup” I can’t help thinking about rodeo round up events that are held in many places across the U.S. These events feature a variety of activities from steer roping to bull riding, and from barrel racing to parades and pageants. What's so great about rodeo round ups? There’s something for everyone! Round-up travel stories have many similarities. These are high-level descriptions, or “roundups”, of what a city or place has to offer. There’s enough variety to offer something of interest for everyone - or at least to the audience the editor wants to appeal to. Round up stories are written in a similar way to travel guides. You won’t go into great detail about the attractions. They’re easy to write because you don’t have to do much in-depth research. Usually a sentence or two—or a paragraph or two—about each tourist attraction will suffice. Because of this, round-up stories practically write themselves. Be aware, you might feel frustrated. The brevity of roundup stories is frustrating to the travel writers who like to go into greater detail about their destinations. It’s difficult to paint a detailed picture of a place or an attraction in two or three sentences in a roundup piece. You have to make the most of a limited number of words. Nevertheless, writing roundup stories is an important rite of passage for novice travel writers. You need to be good at writing these fun roundup stories. 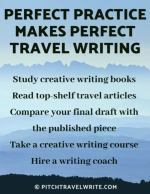 And for many travel writers they form the foundation of their bread-and-butter income. The thing I like most about roundup stories is a pleasant side benefit. By their very nature, roundups cover lots and lots of tourist attractions—and often include “Where to Stay” and “Where to Eat” sections. The benefit is you get to visit all the major attractions, restaurants, and hotels for your research and photos. For this reason, round-up stories give you the keys to the kingdom! You get a big bang for your buck because you can request complimentary entry to all the destination’s tourist attractions. Plus, you can also request complimentary accommodation and meals. Once you have a roundup assignment, you’re perfectly entitled to ask the local tourism agency Destination Marketing Organization (DMO) for their assistance. Roundup stories warm the hearts of the media representatives, because they get to spread the love around all of their clients, versus focusing only on one attraction. Thus, media reps will be more than happy to work out a nice itinerary for you. They understand that a roundup story gives every one of their clients some exposure. A good friend of mine, editor of Northwest Travel & Lifestyle Magazine often calls upon me to write round up stories. In the past few years my round-up stories for Northwest Travel have covered multi-sport events and relays in the Pacific Northwest, the finest rustic luxury lodges in the region, historic Northwest forts, and more recently, romantic fall getaways. Likewise, the editor of a Washington State wine magazine, Washington Tasting Room, often contracts with me to write round up stories about clusters of wineries around the state. These have been some of my most enjoyable travel writing gigs; Linda and I have cruised around 5 or 6 wineries over 2-3 days, wine tasting and being treated like royalty everywhere we go. Other sweet round-up assignments for print and online publications have led to sweet gigs like “The Best Luxury Spas and Villas in Bali” and “Arizona’s Finest Luxury Resorts”. 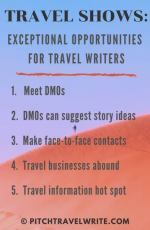 If you like luxury travel and want to write about it, here's how to dream up luxury travel story ideas. Just because round up stories are not in-depth, doesn’t mean they don’t have a story angle. They generally have a theme of some kind. Often they start with titles like “The Best…”, or “The Top…”, or “The Most…”. A good roundup story paints a picture, albeit brief, about your destination. It inspires the thought, “I didn’t realize there was so much to do there!” Top Ten lists do nothing to help us “see” the destination, and nor do they make us want to visit the place. There’s a big difference. - Wine Tasting in Washington’s Tri-Cities (Washington Tasting Room). - Winter in Leavenworth, Washington (Mid-Columbian). - Southern Oregon Ghost Towns (Lost Treasure magazine). Now that you’re aware of what constitutes round up stories, you’ll see them everywhere in your favorite travel magazines. But there’s one big catch with writing round ups: making them sound interesting. You need to take the basic details and inject some life into your roundup stories. 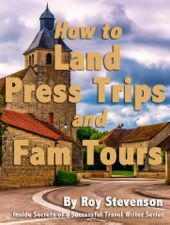 If your article is written like a guidebook—just naming the main attractions— it will be dry and boring. 1. Make the salient points about each attraction engaging and specific. 2. Avoid clichés and mundane descriptors. Using words like “Interesting”, “charming” and “quaint” aren’t interesting or descriptive. 3. Include some punchy sentences that conjure up a vivid image of a place. 4. Appeal to all the senses: sights, colors, sounds, smells, tastes, touch. 5. Describe what emotions you felt when visiting the place. You won’t use all these techniques in every passage. A combination works best. The next two quotes paint pictures of the scenes. The first one includes movement. Both are from my roundup piece about Queenstown, New Zealand. The following three quotes paint vastly different vivid pictures of the same place, using feelings, sound and color. These are from my roundup story about Rotorua, New Zealand, the North Island’s most famous tourist town. Writing round-up stories is a great way to start your travel writing career. Doing the “research” is lots of fun, and once you have mastered them they become easy to write. And don’t forget about the comps that come with covering a broad range of activities. If you don’t know how to go about requesting help from tourist agencies and PR companies, I’ve written a guide about parlaying your assignments into complimentary travel. Travel Story Idea Troubleshooting Guide: "Why Can't I Sell My Travel Articles?"